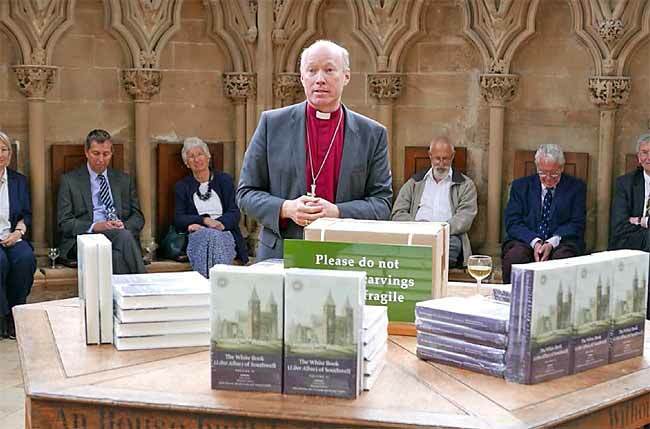 Bishop Paul launches the ‘White Book of Southwell’ in the Chapter House at Southwell Cathedral in May. The Chapter House of Southwell Minster was a fitting location for the official launch, on Wednesday 16th May 2018, of The White Book of Southwell; the first complete edition of an invaluable and extensive collection of medieval documents compiled between c.1350 and 1460. The White Book derives its name from the white vellum cover. Its 500 pages record some 620 individual documents, ranging from papal bulls and royal charters, quo warranto inquiries and privileges granted to the Chapter at Southwell, individual canons (or prebendaries) and the parishes where the Minster held lands or controlled livings. The book was first brought to general attention by Dr Robert Thoroton, the author of the first History of Nottinghamshire (from whom the clergy at Southwell had great difficulty in getting the book back!). The book consists of the original Latin and Norman-French text in which the documents were written and a summary of each document in English with extensive commentaries. 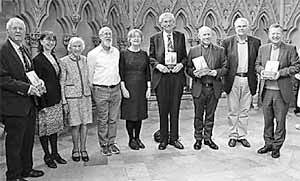 The editors Michael Jones, Julia Barrow, David Crook & Trevor Foulds attended the launch, where Bishop Paul Williams spoke of the importance of the book and the Revd Canon Nigel Coates was presented with a copy for Southwell Minster by Michael Jones. Thanks to their great variety, the documents are important not simply for ecclesiastical history but for broader social and economic trends in mediaeval Nottinghamshire either side of the Black Death. The Derbyshire Record Society - the sister organization to the Thoroton Society’s Record Section - has just produced its 43rd publication in its hardback series. This volume will be of interest to Thoroton members in that it is an edition of the ‘cartulary’ (register of property deeds) of the Leake family of Sutton (Scarsdale) Hall near Chesterfield, the family which also owned the Friary and other property in Newark. The cartulary was compiled in c. 1574 by Sir Francis Leake and contains abstracts of title deeds of all his estates gathered into a single volume. He made several major purchases of former monastic land in north-east Derbyshire. These included lands which had previously belonged to Welbeck Abbey, and the cartulary contains abstracts of over an hundred deeds from the abbey's archives. Most of these original documents have since disappeared but were recorded in the abbey's own cartulary; this is now in the British Library but remains unpublished. The new 352-page edition thus contains abstracts of some 750 medieval and later deeds, many relating to Sutton Scarsdale, Duckmanton, North Wingfield, Killamarsh and Dore in north-east Derbyshire; Etwall and Burnaston near Derby; and Crook Hill in the High Peak. Also included is a very full list of gentry and yeoman landowners throughout Derbyshire dating from the mid-16th century, and a rental of the Leake estate in 1574. A P Munford & A M Hopkinson, eds., The Leake Cartulary and the Derbyshire Estates of Welbeck Abbey, 352 pp, hardback, Derbyshire Record Society, vol XLIII, 2018. Price: Non-members £40 plus postage; Members £25 post-free. Available from Derbyshire Record Society, 9 Owen Falls Avenue, Chesterfield, S41 0FR. In 1588, the Archbishop of York, Edmund Sandys, died at Southwell and his tomb can be seen in the Minster. Dr Robert Thoroton died in 1678 and he is buried in Car Colston where his tomb cover can be seen in the chancel. The other Nottinghamshire born Archbishop of Canterbury was Thomas Seeker who died on 3rd August 1768. He was born at Sibthorpe and became Archbishop in 1758. Less well known and living in less troubled times than his predecessor Thomas Cranmer, but nonetheless reaching the top of his profession! In 1828 George Ridding was born - he was to become the first Bishop of Southwell. Constance Penswick Smith, daughter of the Vicar of Coddington, was born in 1878. She was the founder of The Society for the Observance of Mothering Sunday. She died in 1938 and the Lady Chapel in Coddington Church is dedicated to her memory. One which is not an “8” anniversary but is relevant to this year when we are marking the gaining of the vote by women is Lady Laura Ridding, wife of the Bishop of Southwell, who was an ardent suffragist as well as being a biographer, philanthropist, author and social reformer. The national Portable Antiquities Scheme (PAS) records archaeological objects found by the public in England and Wales. This year it celebrates its 15th anniversary with more than 13,000 finds from Nottinghamshire recorded on the PAS online database, including coins, tools, weapons and jewellery. It is an important source of information for researchers and for everyone with an interest in history, archaeology and heritage. This exhibition will highlight some of the finds from the county and examine the important contribution they have made to our wider understanding of Nottinghamshire. Open Tuesday-Saturday, 11am-5pm; Sunday 12noon-4pm; Closed on Mondays. 'The rights of women - or the effects of female enfranchisement', by George Cruikshank, 1853. Fagan Collection of Political Prints, Pol P 5. The year 2018 marks the centenary of the first UK general election in which some women were entitled to vote. We celebrate that fact by looking back at some memorable elections and exploring how electioneering has changed over the years. Before the first Reform Act of 1832, few people could vote, and powerful aristocrats could sway the results. Papers from the disputed Cumberland election of 1768 reveal stories of coercion, bribery and corruption. Printed ballads and posters give a flavour of the songs and spectacles which attended elections in Nottingham in the early years of the 19th century. Personalities feature heavily in the exhibition. The 4th Duke of Newcastle is shown opposing the Reform Act, and fiercely criticizing his own son’s election campaign in South Nottinghamshire in 1846. Discover the fascinating story of James Morrison, the wealthy MP for Nottingham East lauded as ‘the friend of the poor’. And learn about the suffragists and suffragettes who campaigned for equal voting rights in the late 19th and early 20th centuries. Using original archives and rare books, this exhibition will illuminate 250 years of political campaigning. The exhibition has been curated by staff from Manuscripts and Special Collections at the University of Nottingham. Open Tuesday-Friday, 11am-4pm; Saturday & Sunday, 12noon-4pm; Closed on Mondays. Many members will be familiar with the now well-established annual Lowdham Book Festival, organised by Jane Streeter of The Bookcase, the independent bookshop in Lowdham, and Ross Bradshaw of Five Leaves Bookshop in Nottingham. The Festival attracts large audiences and many ‘big names’ from the world of writing. This year, the final day of the Book Festival was held on Saturday 30th June. The Thoroton Society was delighted that Steph Mastoris, editor of the Society’s latest publication, the Welbeck Atlas, had been invited to speak about the Atlas on the last day of the Festival. Steph spoke to a large audience at the Lowdham Methodist Church, and several copies of the Atlas were sold to members of the public. 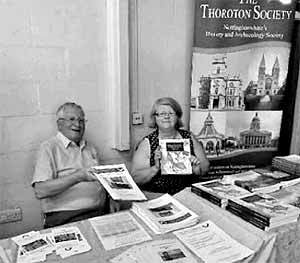 The Society had a stall at the Book Festival and a number of Thoroton publications were sold. At 7.10 p.m. on Monday, 1 July 1918, part of the National Shell Filling Factory number 6, at Chilwell, blew up. The official death toll was 134 and the number injured was probably in excess of 250. The ten days between 20 June and 1 July 2018 saw a series of commemorative events centred on St Mary’s Church, Attenborough. They began with a lecture on the explosion which I gave on behalf of the Beeston and District Local History Society, and carried on with other events including a showing of recently re-discovered film footage which has been made available through the Imperial War Museum, and a play ‘Swan Canaries’, which took place in one of the vast shell stores which has survived since 1918. The commemorative events ended with a service in St Mary’s on 1 July. At the service, the preacher was Bishop Paul, the diocesan bishop, and the congregation included the Lord Lieutenant, Sir John Peace, the leader of the county council, the chief executive of Broxtowe Borough Council, and local M.P. Anna Soubry. I was one of those fortunate enough to have a ticket - the first time I have ever had to produce a ticket to get into a church service! The church was packed, as also was the marquee erected for a family day on Saturday 30 June. I was particularly struck by two things: the new memorial, dedicated by the bishop, and the parade of young soldiers from Chetwynd Barracks (the site of the factory which exploded), who could so easily have been marching into battle - it was of course 1 July, the 102nd anniversary of the battle of the Somme. For a number of years, planning has been under way to create a memorial to the three aircrews which crashed over Bleasby during the Second World War. Even though deep in the countryside, the villages in this area saw a good deal of wartime action. With so many airfields in this part of Nottinghamshire and in Lincolnshire, the skies were constantly flown over and, consequently and tragically, there were a significant number of crashes in this area. Bleasby, being just across the river from RAF Syerston, did not escape these events: two Lancasters and a Wellington came down in our parish, with the loss of the entire crews. On 6th February 1941 a Wellington, R1014, with a crew from 304 Squadron, a newly established Polish squadron, came down shortly after taking off on a training flight from RAF Syerston - it crashed near where the school now stands. All four Polish airmen, Sergeants Cymborski, Jonczyk, Lichota and Tofin, were killed. The two Lancasters, JB132 and R5698, collided over Bleasby on 1st September 1943: this was recorded in the school logbook. They were flying at night with only navigation lights, one undertaking a night cross-country training exercise from its base at RAF Wigsley and the other just returning from active service in Germany and heading back to Syerston. The wreckage was scattered over 40 acres of the hillside fields between Rudsey Farm and Brickyard Farm: all fifteen aircrew died. The crews consisted of men from all parts of the United Kingdom and also from Eire, Australia and Canada and the average age was 25, the oldest being 38 and the youngest just 19. It was the commemoration of the start of the Great War held in Bleasby in 2014 that sparked a desire to erect a memorial to all these airmen who had died in Bleasby in WWII. A small group consisting of Bleasby residents was brought together by Ken Ogilvie, a local man who spearheaded and drove the project. The design was created with the help of a local architect and it was decided that it should take the form of a Lancaster’s propeller and tailfins and that it would be carved in granite by the stonemason, Michael Wright. Fundraising commenced and local people were very generous in contributing and, with a substantial grant from the County Council and the encouragement and support of the Parish Council, the joint project of Bleasby Local History Society, St Mary’s Church and Bleasby Parish Council was well underway. 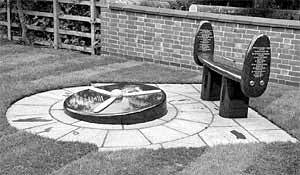 The memorial is now complete: around the propeller it records the names of all the crewmen of the two Lancasters and the Wellington: on the tailfins there are inscribed names of other airmen who died in aircraft accidents near to the parish. Ken Ogilvie, with heroic determination, has tracked down relatives of those killed, many of the families having had no idea where their loved ones died, and a number of them, along with representatives of the Polish, Canadian and Australian Air forces, as well as the RAF, are to attend the service of thanksgiving and dedication of this new memorial, now installed in the Glebe Field next to St Mary’s Church. This dedication is to be held on 1stSeptember 2018, exactly 75 years to the day since the Lancasters crashed over High Cross fields. We were very sad to hear of the death in May of one of our long-standing and loyal members, Claire Wells. Claire was a regular attender at lectures, the annual lunch and on excursions. Her niece Jacqui has given us some details of Claire’s life for which we are very grateful. Jeanne Claire Elizabeth Wells was born in London on 7th July 1929, ten minutes before her twin Shirley. She disliked the name Jeanne and was therefore always known as Claire. For the first ten years of her life she lived in Fulham and Parsons Green, enjoying a happy childhood with Shirley and her older sister Gwynneth. All that changed when the war broke out. Claire and Shirley, aged ten, were evacuated and for the next six years hardly saw their parents. They were moved from family to family within the Baptist church fraternity, sometimes staying only a few months, sometimes a couple of years. Claire remembered it as a difficult time, having to work hard at weekends in the church, cleaning being the main duty. When war ended in May 1945 they were desperate to get back home but found it difficult to adjust having left home children and returning as young adults. Claire began work at the age of 16 in the Probate Department of Farrer & Co in Lincoln’s Inn Fields. In 1948 Farrers were appointed solicitors to the Olympics and received complementary tickets - Claire was lucky enough to get one for the Opening Ceremony. After about 5 years Claire obtained a grant to study speech therapy and, once qualified, she followed a successful career in this field for many years. She also taught drama including to inmates of Wormwood Scrubs Prison! Claire was a great traveller, including visits to China and Russia - she even lived in Canada for a while, working as a speech therapist. She moved to Nottingham when she retired in 1989 to be closer to her older sister Gwynneth and her family. Once here she joined the Bromley House Library, the WEA, the Thoroton Society, the Lenton History Society and Nottingham Civic Society. She was always very appreciative of the company of like-minded people. Later on she developed a great interest in trees - of all sorts, shapes and sizes. 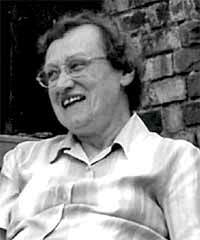 She studied them in great depth and carried out research at the University of Nottingham, recording facts and statistics for many years. Claire lived an interesting and full life; indeed it was a life well lived. She will be much missed. Can we remind researchers that up to £2000 is available for people undertaking research into Nottinghamshire history? This is thanks to Geoffrey Bond’s generous grant of £1000 together with another £1000 from Thoroton funds. Applications are invited from individuals or societies which will need to be sent to the Honorary Secretary of the Thoroton Society by 1st September 2018 at barbaracast@btinternet.comDetails of the terms and conditions are available on the Thoroton website or contact Barbara Cast as above. In 2017 awards were made to Southwell Community Archaeology Group for its community archaeology project to research, compare and document the wall-paintings in the Saracen’s Head, Southwell, and also to Bassetlaw Christian Heritage for its project to identify, research and document information on the unique part the Bassetlaw area played in Christian history and which is held in document form in archives and churches, and also orally. It is hoped that more individuals and groups will apply for this useful financial support for their research in 2018 and we would urge all researchers to consider whether they could be helped in their endeavours by a grant.